Visual Studio Code>Other>SyncingNew to Visual Studio Code? Get it now. Synchronize all of your VSCode settings across multiple devices. Syncing (View Source Code) is a VSCode extension, designed to synchronize all of your VSCode settings across multiple devices with your GitHub Gist. Getting started or check out the examples. Keep it simple & reliable! Increase the download speed and accelerate the process of adding and installing VSCode extensions. VSCode builds under FLOSS license, see VSCodium. Self-compiled VSCode under the default configuration (Thank @Backfighter for the PR). Don't worry, Syncing will automatically identify the VSCode edition for you. Including your User Settings, Keybindings, Extensions, Locales and Snippets. The keybindings of MacOS and non-MacOS will be synchronized separately, in case you have multiple devices of different operating systems. Automatically create a new Gist to store your settings. Use an incremental algorithm to boost the synchronization. You can exclude some VSCode User Settings and Extensions from being uploaded, check out the VSCode User Settings for more details. Automatically install, update and remove extensions. You can download settings from a public Gist, such as your friend's VSCode settings, check out here for more details. You can exclude some VSCode User Settings and Extensions from being downloaded, check out the VSCode User Settings for more details. Besides, you can set up a proxy to accelerate the synchronization. And of course, you'll have a progress indicator during the synchronization :). Upload settings to GitHub Gist. Download settings from GitHub Gist. 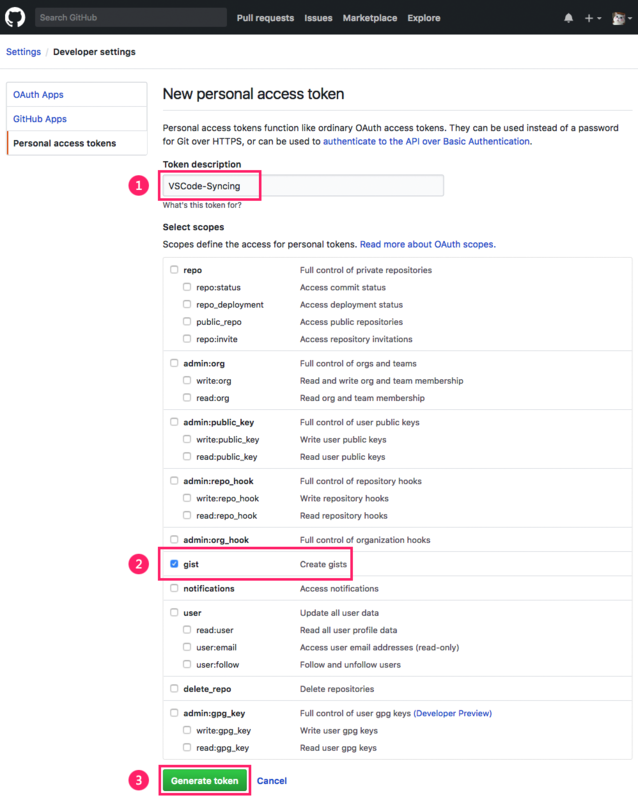 Set your GitHub Personal Access Token, Gist ID or HTTP Proxy settings. You can find the following Syncing Settings in your VSCode User Settings. You can configure glob patterns for excluding some VSCode Extensions from being synchronized. Note that the extensions not listed here will still be synchronized. Now the extension nonoroazoro.syncing (i.e., Syncing) and all the extensions of the author somepublisher will no longer be synchronized. You can configure glob patterns for excluding some VSCode User Settings from being synchronized. Note that the settings not listed here will still be synchronized. Now the workbench.colorTheme setting and all the settings of editor will no longer be synchronized. You can configure this setting to let Syncing automatically update your extensions during the synchronization. This is enabled by default but you can turn it off in your VSCode User Settings. During the synchronization, Syncing will check the changes between your local and remote settings, and display a confirm dialog if the changes exceed this threshold. The default value of this setting is 10, and you can disable this feature by setting to a number less than or equal to zero (<= 0). Synchronize the keybindings separately for different operating systems. You may disable it since VSCode has introduced the Platform Specific Keybindings from version 1.27. But please make sure you've already merged your keybindings before disabling this setting. Type "Syncing: Open Syncing Settings" (or just "opensync") in VSCode Command Palette to open Syncing's own settings file (i.e. syncing.json). Moreover, if the "http_proxy" is unset, Syncing will try to read the http_proxy and https_proxy environment variables as a fallback. Please note that unlike the settings in VSCode User Settings, Syncing will not upload its own settings file because it contains your personal information. Get your own GitHub Personal Access Token (3 steps). Login to your GitHub Personal Access Tokens page and click Generate new token. Give your token a descriptive name, check gist and click Generate token. Copy and backup your token. Syncing will ask for necessary information for the first time and save for later use. Type upload in VSCode Command Palette. Enter your GitHub Personal Access Token. Select or enter your Gist ID. You can leave it blank to create a new Gist automatically. After it's done, you can find the settings and the corresponding Gist ID in your GitHub Gist. Also, you can Edit and make it public to share your settings with others. Type download in VSCode Command Palette. You can leave it blank if you want to download from a public Gist, such as your friend's VSCode settings. Select or enter your Gist ID or a public Gist ID.